This is a prime lens manufactured by Canon and the model was launched 1999. The lens has a focal length of 600 mm. Depending on which camera the lens is used, the experienced and perceived focal length will be different. Please visit the list of compatible cameras below, it will provide the equivalent focal length you get on each camera. If you want to use filters on this lens the slot-in filters (52 mm) would be the ones to use, which is very common at these larger telephoto lenses. If you buy this lens it will come with a lens hood, whose model name is "ET-160". This lens has been replaced by a newer version. Prior to purchasing the lens, please compare the various editions. Text from Canon: "Large-aperture telephoto L lens with a camera shake correction function, which is best suited to nature and sports photography. 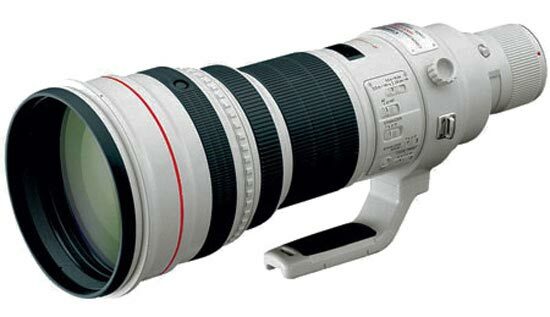 Developed as a successor to the EF600mm f/4L USM. A fluorite lens and two UD lenses are used in the optical system to assure very high picture quality. This lens has also a protection glass and a rear filter as standard, which are included in the number of lenses. The camera shake correction has an effect of approx. two stops* in terms of shutter speed. This lens has also ”camera shake correction mode 2” which corrects shaking of the viewfinder image when, for example, shooting a moving object, and a tripod can be used with the camera shake correction function ON. High-speed autofocusing is achieved by the weight reduction of the group of focusing lenses and improvement of the autofocusing drive algorithm. A new AF stop function, which stops autofocusing temporarily, is adopted. Manual focusing is performed mechanically to save power. Main components are made of a magnesium alloy to reduce the weight of the lens, including the optical system, making it much lighter than conventional lenses. Rubber parts are used as mount and switch components to achieve excellent dust- and drip-proofness. The tripod mount can be removed, and the drop-in filter 52 (standard), carbon fiber hood, and suitcase-type lens case are designed to be easy to use. * Based on the ”1/focal length” second which is a yardstick to indicate the limit for camera shake prevention. This lens is ideal for sports and wildlife photography. The newly designed optical system has one fluorite element and two UD-glass elements to obtain high resolution and high contrast. Also, the minimum focusing distance was reduced to 18 ft. (5.5m). Extender EF 2x II can be attached to increase the focal length to 1200mm while retaining AF (at the center focusing point with the EOS-1v and EOS-3)."